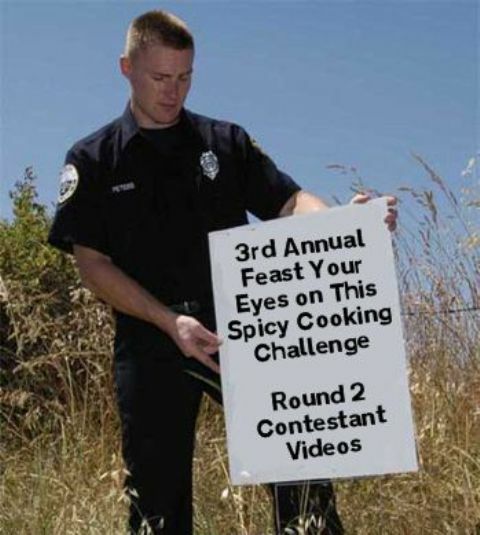 Feast Your Eyes on This Spicy Cooking Challenge 2012- Round 1 Contestant Videos – I Love It Spicy! To purchase the best of what Cajun products have to offer from last year’s Feast Your Eyes on This Spicy Cooking Challenge Champion, Clement Bourg, please click the picture of Clement above. Use the Coupon Code: ILIS and you will get 25% off your order. Clement is giving a $50 cash card to the winner of this week’s round. To our contestants Clement is also a judge, so the more you purchase the more he might favor your video. He is a Saints fan and you know how they feel about getting paid to do something they know is wrong. Thanks Clement for your sponsorship! If you are in the need of a co-packer, sauce maker, and/or recipe creation specialist, why not try Endorphin Farms for your next bottling experience. They are fully inspected by both the Florida Dept of Agriculture and the FDA. Unlike some others, they do not bottle their own sauces, they only co-pack. Contact them today by clicking their picture above, and let them show how they will let you concentrate on your business, while they do the hard work for you. With all the recipes, we ask our contestants to be creative and make each dish spicy in nature. The 1st place prizes are free booths at the Houston Hot Sauce Show & the NOLA Hot Sauce & Gourmet Show. We also have $100 from Race City Sauce Works for the runner-up, and every round has a $50 money card to the winning recipe video. Judges please take note that 2 videos(Maria & Rob) were submitted late, so they will be penalized in your scoring under the rules criteria. Anyone over the 5 minute mark should also be penalized, so keep that in mind when scoring as well. Let us now take a look at the videos. They are posted in order of receipt. April 25- Winner is announced! I feel so bad for Maria because of all the editing problems they had in putting together their video. The ribs looked great if that is any consolation. Other than that, great recipe videos guys. I am glad I wasn’t hungry when I watched it or I might have licked the dust off of my computer screen by accident. Sorry for the editing on our part, imovie just did not want to cooperate with us, however we did learn a lot about our new camera after shooting this video… we hope everyone enjoys what they were able to get out of our video.. aslo awesome job by all contestants your videos looked great! A few pointers if you care to listen. GET A TRIPOD! A smooth steady video will eventually mean the difference. You can pick one up for around $20. Lighting makes a difference. If you can’t add lighting to your room (spot lights) then play around with the lighting features in your editing program. It won’t be as good, but it’ll be better then nothing. Try and minimize background noise. I know this can be tough, I’ve had my fair share as well, but if you have a quiet studio your voice will project better. Also use subtitles when you’re unable to speak or have to edit out a segment where you were speaking. Finally, try and have fun. It will/does show! potato, potato, potato, potato, potato…. It is, but windows crashes too often. If you have a mac take the time to learn the software. It will make a difference! I bought my make because of last years contest and all the problems I had with windows crashing. As the contest progresses and you have more and more video to edit, the bigger the pain windows becomes! I gotta say, I think all the contestants are great. This is not an easy thing. I had a great time doing this though! I have to agree with Clement, a tripod works wonders. I had to be camera person & chef, (as well as director, gaffer…(what is a gaffer anyway? ), & chief dish washer). And planning out what you look to have your final video discuss before you shoot. The hardest part for me was to get it down to five minutes. My original video was 10 minutes long, so I had to go in and edit it with a chain saw, not a scalpel. And again, Cajun Heat Clement is right with having fun with it! This is a great promo for all of us & our companies, so let’s show the fans we can have fun with ourselves! Again, congrats to all the contestants!! That was fun and lots of learning going on… Thanks for tips and keep them coming!!! Lots of good stuff already… I’m traveling all week again this week too. thats why i invested in a mac, but i never ever had an issue until recently.. i was in shock with all the crashing with imovie even with rebooting several times… will be upgrading the O/S on tuesday cant wait to play around with all the new features… and finally getting use of icloud..
i agree with you Steve, its really hard to edit what your cooking, so much going on that you want to show..
Having alot of fun. wish I had more time in the video. mine was 25 mintutes long hard to cut. WOW! Everything looked so good! We are really excited to be part of this competition and get to know the other competitors through their cooking – 3 of us are from PA right – good representation for the commonwealth! Our observations so far as a competitor; the cooking is the easy part (and the fun part) while the editing is a drag, I also had problems and serious challenges with 5 min limit. Chris-that pizza looked amazing even if Buddah doesn’t like Chicago style! Chip-love your choice of cooks beverage (enjoyed one of the same off camera myself! ), Maria-sorry you had vid problems but I was inspired to lay down while watching it. Hope everyone enjoyed the wings! Shauna rocks!!!! Her stuff is the bomb. Man alive, all those dishes looked great. The pizza and the wings were my favorite. Had to go for the wings because of the addition of the salad. Great job by everyone. Jeff- Thanks and the wings looked great. The Nugget Nectar is one of my favorites. Good lick to you the rest of the way. I’d say thanks for the good lick and same to you but…..what would Jackie Gleason say? Man, Being a judge has got to be tough! So many good recipes and your food looked amazing!!!! Good sound and light do make a big difference from the viewer’s perspective!! Chris’s pizza looked just like the pizza I had at Lou Malnati’s in Chicago a couple weeks ago! And Venison tenderloin burgers!!!! OMG!!! and the flavor profile of the meatballs and sauce! just sayin…… I could go on and on about everyone! Great job everyone! I think these folks are just getting warmed up! Great job on the videos everybody!